This is the commonest seal range for various rotating equipments - because of its simple construction employing secondary seal in the from of a rubber bellow. 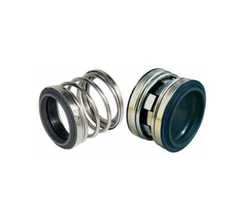 These seals also offer advantage of single - coiled seals and are available with an array of face combinations to suit different applications. Backed by a rich industrial experience, we are engaged in offering a huge array of Rubber Bellow Mechanical Seals to our customers. - We are offering rubber bellow mechanical seals that are fabricated with viton rubber using latest technology. this seal is perform flawlessely under temperature of 30 Deg C to 150 Deg C.
Our firm is amongst the renowned manufacturer in offering optimum gamut of Rubber Bellow Unbalanced Seal. 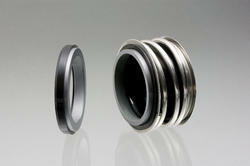 Rubber bellow seals are the most general purpose, low cost seals. The mediums are all type P-28 or centrifugal pumps turbine pumps, agitators, mixers, refrigerators, compressors etc.